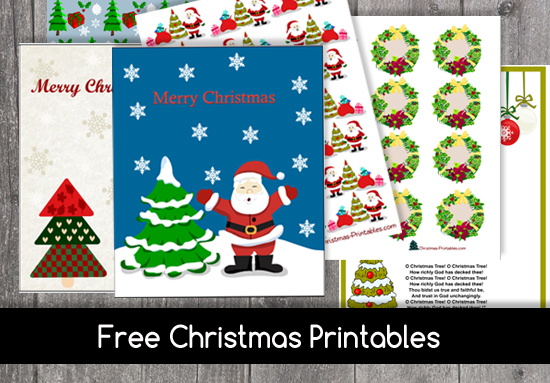 Welcome to Christmas-Printables.com . On this site I am trying to provide very hight quality, cute and original free printables for your every Christmas need. You can easily print any of these printables using your home printer and share the love, joy and fun with your friends and family. Some of these printables are just made for kids and other can be used by anyone. You can make printed gift items using these printables such as bookmarks and coloring pages books. You can decorate your gifts, crafts and other items with these adorable images and graphics that I am providing on this site. Here is the list of free Christmas printables that I am providing on this website. If you want to wish your friends and family in a real cute and unique way you can use any of these free printable Christmas cards that I have crafted on my computer. Write a love filled warm note to someone this Christmas or use this stationery to make lists of things that you may need this Christmas. You can also ask your kid to write a letter to Santa using this Stationery paper. Stay organized this year with this free printable Christmas planner and to do lists that we have made for you. There is an adorable planner cover and 12 different to do sheets and a calendar that will help you staying organized this year. Cute coloring pages of different Christmas related objects and items. Kids will love these pages. Different coloring pages with images of Santa that you can print and put together to make a set. On this page you will find coloring pages with different looking Christmas trees. Cute elves coloring pages that kids will enjoy to color. Free printable candy and gum wrappers that can also be used to wrap gifts and as scrapbooking paper to save your Christmas memories. Different beautifully designed bookmarks that you can give to your friends and family as Christmas gifts. These are printable pages with cute dot to dot Christmas activity for kids. Decorate the gift items and other objects this Christmas with these adorable Labels. Add these beautiful tags to Christmas gifts to make those look perfect. Cute and easy to assemble free printable paper craft bags for Christmas that can hold small and cute gift items. DIY cute and small free printable Christmas boxes to hold small gift items. Free printable DIY advent calendar boxes that you can use to give small surprise gifts to your loved ones every day. On this page you will find cute and free printable gift baskets decorated with Christmas graphics. These adorable Cupcake toppers can also be used as round labels to label different items on Christmas. Make your own wrapping sheets or decorate walls, bed linen or cushions with these Christmas stencils. Make it easy for your guests to find their place at dinner table with these Christmas place-cards. Here are free printable postcards that you can send to the loved ones who are living far away. A collection of Christmas Carols and songs decorated beautifully with Christmas related graphics. Cute and fun to play free printable Christmas games. Adorable free printable Christmas countdown stickers and/or calendar. Free Printable Christmas Washi Tapes decorated with adorable water color graphics. Super cute free printable Christmas stickers in various sizes and colors. Beautiful free PNG clipart with transparent background. A collection of free Christmas related PNG clipart that you can use in your crafts projects. Images of Santa with a transparent background, free for personal use. Different images of cute Christmas trees make this free clipart a real treat for Christmas. Colorful stockings clipart decorated with different images and objects.